CHARLOTTE, NC--(Marketwired - Oct 1, 2015) - CNL Commercial Real Estate (CCRE) announced today it has entered into an agreement with the Charlotte office of Virginia-based Thalhimer to add nearly all the Charlotte employees into CCRE's existing platform. The Charlotte partners and CCRE, in conjunction with Thalhimer, concluded CCRE was an ideal solution for both clients and associates. The combined teams will create one of the largest full-service real estate platforms in the region. "We are proud of our accomplishments as a team and have explored many options. CCRE presents the best opportunity for our clients and our associates -- the primary keys to our success," said Brian Brtalik, Charlotte partner. "We wanted a firm that mirrored our culture and in CCRE, we found a common vision: collaborative environment, respect for fellow employees, treatment of clients like partners, and a desire to be the best, not the biggest." Thalhimer's Charlotte team complements CCRE's growing presence in the market. The addition of the Charlotte team will bring the number of CCRE employees in North Carolina to 80, including 20 brokers. Additionally, the combination will increase CCRE's leasing and management portfolio to approximately 24 million square feet. "In planning our growth in the Charlotte region, we looked to Thalhimer Charlotte as a model," said Ken Loeber, principal and president of real estate services at CCRE. "Combining talented professionals, a tireless work ethic, and enviable culture, they became a dominant force in the Charlotte market. We recognized a rare opportunity to partner with people who embrace our same core values and commitment to customers, associates, and the community." "Thalhimer, from top to bottom, is intensely focused on creating value for our clients. We are proud of the organization we built with our partners in Charlotte and the value created for our clients and associates. The transition to CCRE presents an excellent opportunity for the continuation of this winning culture," said Lee Warfield, president of Thalhimer. "I am honored to begin working with men and women that not only do I respect, but who are also some of my best friends in the real estate community," said Charles Jonas, Carolinas market leader. "Their focus on clients, delivering best in class service and value creation is an amazing fit for our organization, and I'm confident that the addition of these new associates will provide a platform for service delivery unparalleled in North Carolina." 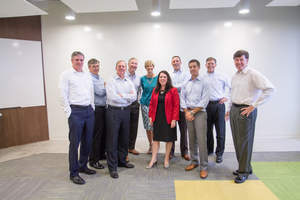 The new team at CCRE, from left: Warren Snowdon, Bill Simerville, Brian Brtalik, Charles Jonas, Susan McGuire, Brandy Garnero, Mark Holoman, Eric Ridlehoover, Lane Holbert and Ken Loeber.